I'm approaching the end of term with a mixture of relief and anxiety. Relief that the pain of getting Katie and Pip to school and pre-school on time; fully dressed; hair brushed; teeth brushed; lunches packed; homework ignored is about to come to an end for 6 weeks. Anxiety for obvious reasons. I have to now entertain them for the holidays. If the past 6 weeks of pre-transition turmoil are anything to go by I have a holiday of a mouthy, whiny, shouty, anxious and controlling 8 year old and a currently regressed to pre-verbal, whiny, shouty 3 year old to look forward to. 6 weeks of them hitting each other; telling tales on each other; Pip trying to escape to our neighbours garden to see his water fountains; stealing from each other; bleating "MuuuuuuuuuuuuuuM" at me like angry, abandoned baby lambs; asking me constantly what we're going to do partly out of boredom and partly out of a need to control every moment of every day. This time of year is particularly stressful with the school transitions coming up so controlling every minute detail of every single day is big time fun here at the moment. I was a child who was happy with a good book. I'd read everything I could get my hands on and was my happiest up a tree reading. Of course I had a mother who couldn't understand why anyone would want to spend their time up a tree reading when there were walks in the forest or the dreaded bike rides to be had. I would be delighted to have children who wanted to spend their time reading - even if a tree was required to set the scene perfectly and find it hard to understand my mother's disapproval of the undemanding child I was. Sadly Katie gets bored with reading after about 5 minutes due to hyperactivity brought about by FASD and Pip can't read yet and much prefers being outside finding woodlice. He does love being read to though so I'm hopeful for the future and maintaining a healthy dose of denial about the needs of my busy son. I do like the idea of a nice family film where we all sit quietly with popcorn and watch a whole film and I'm ever hopeful that that will happen on our sofa one day. One thing I learned very early on was that being outside works better for my children. The one blessing is that now Pip is older and very robust we can get out and about and burn off lots of energy. My ongoing fatigue does present a bit of a challenge meeting that objective some days so I have to try and be creative with my plans for the days when we're home due to needing some down time or when it's wet. When I say "creative" don't be getting all misty eyed and thinking that means arts and crafts. Those three words are like someone grating their fingers down a chalkboard to me. I don't do arts and crafts as such, especially anything involving glitter glue. Things like that are for school in my opinion. I come out in hives at the mere mention of painting but I do have a few tricks up my sleeve for rainy days when we can't force ourselves on some poor friend who might be offering a play-date and a nice cup of tea. 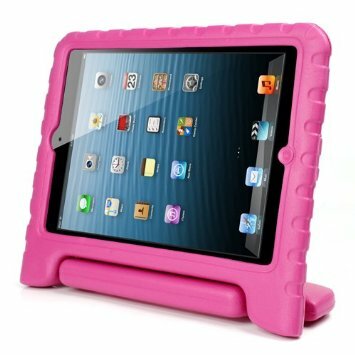 I know I should say I limit iPad time to 30 minute sessions. I don't let Katie and Pip play on their iPads all day long but they are fantastic to help re-regulate my children when it's all getting a bit too much. Unlike some children more is more when it comes to technology in our house. The flickering lights and sounds help my children's brains calm down. Their breathing slows and they can sit and settle and even relax a bit. I do make sure there are some educational games on their iPads to make myself feel better but Katie mostly just watches Shopkins reveals on YouTube with the highly irritating Paul and Shannon and Pip likes watching Coldplay videos and this fantastically hilarious Aussie bloke who catches spiders. iPads are fantastic inventions in my stressed mummy opinion and they do the job of stepping in as a substitute babysitter quite nicely at times just as the TV does. The children have these highly robust iPad covers that enable them to safely carry their tablet around with them. One trick I have learned though is to install an app that turns off their iPads when I've decided their time is up. Too many arguments with Katie when I went to retrieve her iPad led me to find OurPact. Using this app I can set how long they have their iPads for and if necessary I can block their iPads with a tap of a button. Best app ever in my opinion. It's stopped lots of arguments here because Katie accepts when it turns off - probably because I'm not hovering over her with my hand outstretched asking her to hand over her prized possession and pushing her non-compliancy buttons. iPads stop all the "Are we there yet?" in the car as well. My tip for easy fun is to get down to the local pound shop; Home Bargains; and supermarket and stock up on shaving foam; pasta; rice; a few large buckets and some decorating paint brushes. I admit you might have to clean up some mess but you will get some time to yourself with these activities so it's important to weigh up the time investment in clearing up vs the time you get to chill whilst the activity is going on. Shaving Foam: Squirt loads of shaving foam in a large bowl or planting tray (maybe a bowl each if you have squabbling children) and let them play with it. They will make up their own games. This is good for at least half an hour and it smells lovely. Put the kettle on and try to enjoy the sounds of the children having a great time rather than worrying about the clean up. Unlike paint you can clean up shaving foam very easily and it doesn't leave any stains. If you have a safe place for this activity you can even add some food colouring to the foam and let them make rainbows and other colourful creations. 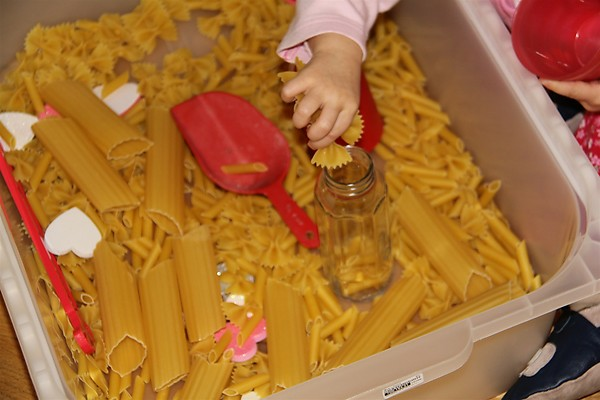 Pasta and Rice: Using the bowls or planting tray (or play table if you have one) fill them up with the rice and pasta (uncooked of course). Give the children some cups and jugs etc and let them play. This is a great activity when the children are in mid-argument. It works like a charm for redirecting their energies. Pip likes to eat the pasta and I try not to mind too much. Yes there is more of a clean up with this one but the children love the sounds of pouring out the rice and pasta and the feel of it. If you really want to extend the activity then get out some paper or card and the dreaded glue and make some pasta pictures. I can just about handle this! 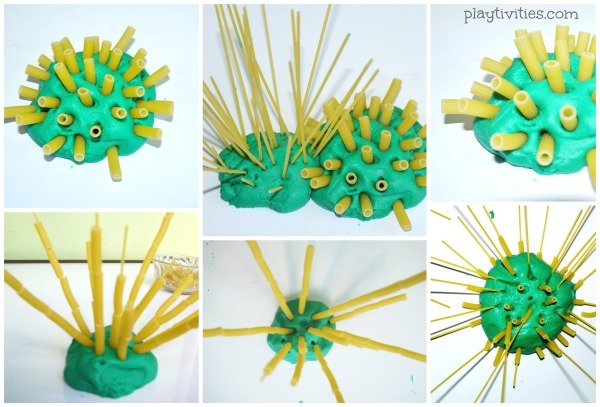 You can make coloured pasta or stick spaghetti into Play Doh! Sensory Boxes: Before the holidays make up boxes (the size is entirely up to you) with lot of different things inside to fiddle with. Cotton wool; ribbons; bells; material that is furry or sparkly - you can use old scarves; buttons; stones; magnifying glasses; sticks - the choice is yours. Don't overuse this activity but have it ready to whip out when tensions are running high and the children need to calm down a bit. You can make it age appropriate for each child. I rather liked the idea of the Rainy Day box that Charlie and Lola had with Marv in "It's Raining It's Boring" with lots of silly games to play as a team inside. Water Painting: On a warmish day fill up some buckets of water. Give the children decorating paint brushes and take them to a brick wall outside. The house wall or a garden wall will do just fine. Get them to paint pictures with water. It dries off nicely; no mess is left; it gives the children a little bit of exercise and helps burn off stress. This activity probably works best with swimwear (or waterproofs) because the water is going to get thrown about. Not one to do when you're just about to go out somewhere. Play Doh and Lego! We rarely get bored with Play Doh and Lego. Both Katie and Pip will rub along fairly well playing either of these. I have a plastic children's table and chairs that I pop in front of the TV to extend their attention span for these activities as well and either join in or have a cuppa whilst supervising. You can even run the pasta time into Play Doh time! 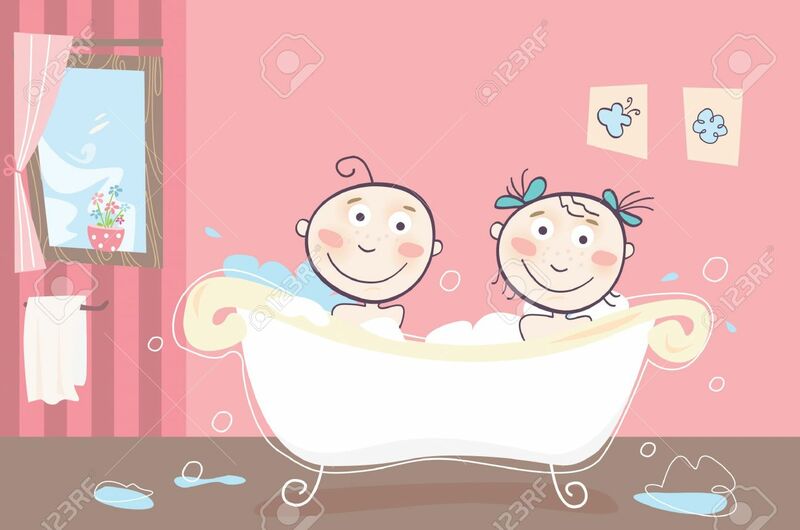 Bath Time: My best tip for a stressed parent is to run a deep bubbly bath and put the children in it. Obviously this works best for younger children. This is brilliant for when the children are tired and getting grumpy on a wet day. You can do it at any time of the day and I've used it often when I'm close to losing my temper. Run a bath. Fill it with bubbles (or some of that coloured gunk stuff) and let them wash all that angst out of their little systems. You could even fill the bath with shaving foam and let them play in the foam for a while. Follow with a hot chocolate and a film and you can all calm down nicely. We love being outside. Well. as you now know, I'd prefer to be up a tree with a book but I've found my children are much more chilled and manageable if we're busy outside somewhere where there are trees and preferably water and we're running or walking (they do the running!). Nature really does calm the troubled soul in our house. We have membership for our local gardens and often take a simple picnic and spend the day there. There is a lovely stream that the children can paddle in and some swings and a tree house. There are also lots of lovely flowers and beautiful smells for me to enjoy plus a good walk to tire my little darlings out. Pip will happily spend hours turning over the wood stumps in search of creepy, crawly, critters. I like memberships of places that I enjoy as well. We don't do theme parks because none of us like the rides but we do also have a membership for our local zoo. It's a huge one so takes all day to wander around and there are parks to play in (for the children) and animals to watch (for me). They have a sand park which the children will happily play in for at least an hour whilst I watch them with my cup of tea. On a warm day we will go to our local water park. My children will play here until they are blue and I don't have to move a muscle to entertain them once we're there other than to wrap a towel around them occasionally and provide snacks. We live near the New Forest and various beaches so we can get down to the sea and throw stones in the water or go for walks through the forest. I've found places with water to keep Pip happy. I pop the bikes in the car and take them to a nearby BMX track. This is a treasured activity. We go to country parks with friends and walk the children until they drop. I prefer doing these activities with friends personally because I do like to have a natter and generally the children will pair up and play together or run like wild horses all day long. Trying to vary where we go to avoid complaints like "Not Again!" is important but I'm afraid I don't really pander to this and the children accept happily that we'll visit our membership places on several occasions. I'm not always the most organised or original person with planning everything to the Nth degree so we are fairly ad hoc which I know isn't always the best for my children but some days dawn differently than the plan from the night before and we do have to try and go with the flow a little bit. Some days things go horribly wrong and we just don't make it out of the house in order to calm overstimulated minds. For me, seeing as many friends as is humanly possible and trying to vary things as much as possible is my plan (and salvation) over the coming holidays. My sister and I are planning day trips out on the train for a bit of fun and adventure and maybe even take the car over to the Isle of Wight for a ferry trip and some beach fun. I'm busy booking dates in the diary with other friends and am looking forward to catching up with people. We haven't got a holiday booked yet but might try and get away somewhere in the UK as a last minute plan. We have some new kittens joining us in August so I rather suspect Katie and Pip will be all too happy to stay home and play with the kittens and have day trips out. Here's a sneaky peek at our new furbabies Zala and Bay. We've known them since the day we were born and have been helping to take care of them since their birth so they are very accustomed to spending time with the children. They are now 6 weeks old and have spent several weekends at our house already with their mum when their other mummy human has gone away for the weekend. The children are beside themselves with excitement for their moving in date! Baby Bay - he loves to snuggle up in my arms and fall asleep! Zala is amazing with Katie and is very calm and chilled! So what are your sneaky cheats for the school holidays? What do you do to get a few minutes peace? What activities keep your children engaged and amused? How do you manage keeping your children regulated? Do share your top tips! I'd love to hear them! They might just save my bacon as well! 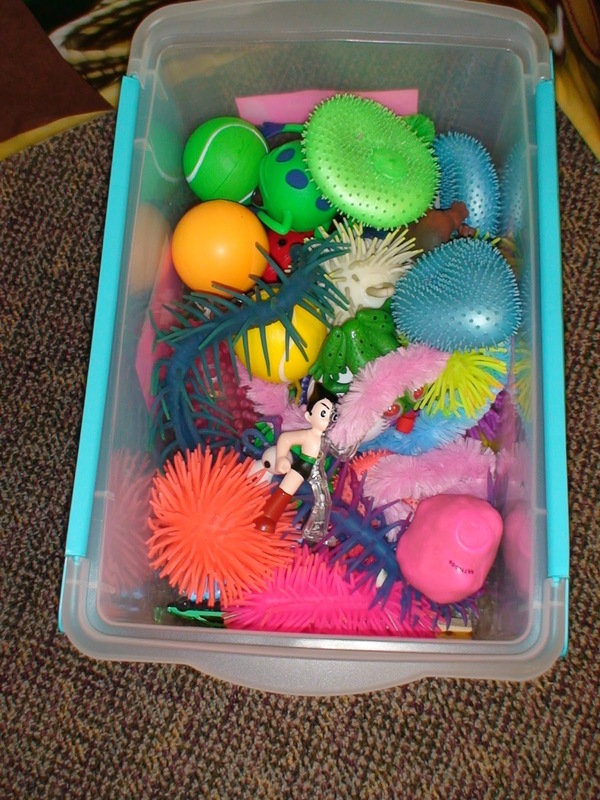 Love the ideas for sensory play. I like to set up little treasure hunts for my son. One being a book treasure hunt. Hide short stories around the house and when the books are found we rush to be together, to cuddle up and enjoy a pause in the day to read the book. Nice way to change the rhythms of the day and show him he is important to me and he always feels really good about finding the books!